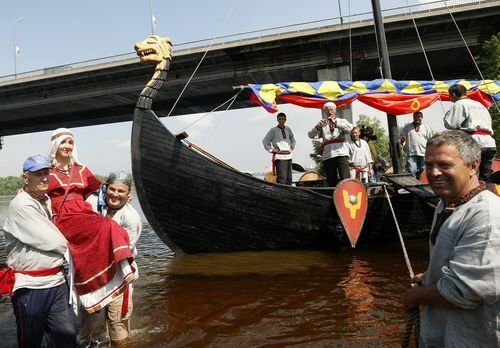 For nearly a decade by joint efforts of the Kyivan Rus’ Park and the Institute of Archaeology of the National Academy of Sciences of Ukraine the work on restoring the military boat from the period of Kyivan Rus’ of 9th-11th centuries was conducted. The experiment successfully finished with the launch of the legendary boat on May 15. Right away the organizers turned it into a scientific experiment. Once Prince Volodymyr had been presented to the journalists, the boat set off on a scientific expedition along the Dnipro River in order to determine the maximum speed of the boat with the sail set on and without it. According to the president of the Kyivan Rus’ Park Volodymyr Yanchenko, the boat has been already registered as an experimental vessel. The total passenger capacity of the boat is up to 25 people, ten of them being rowers. According to Yanchenko, it is planned that the boat will sail on the Dnipro River, Azov and Black seas, and will also participate in international regattas of historic ships.